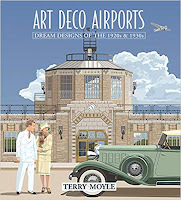 The title is Art Deco airports but it's much more far ranging than a narrow architectural survey of these places. It looks at eleven in Europe and twenty-six in the US and oddly for a book from an Australian publisher nothing on airports in that country or even New Zealand which has the art deco center of the southern hemisphere in Napier on the North Island. European airports get a better showing than those in America, Croydon Aerodrome, London's main one in the twenties, gets sixteen pages but Chicago's Municipal only one page. 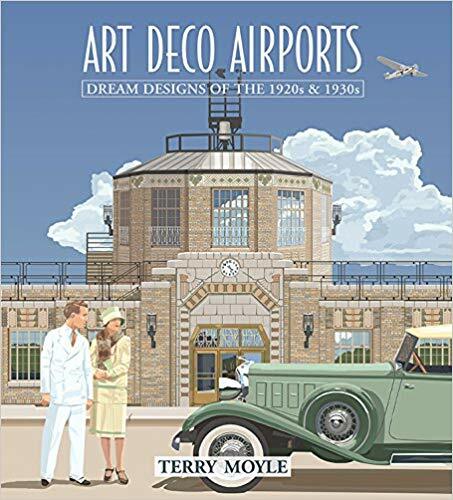 The copy throughout the book seems to be based on the social history of airports and the aircraft that landed there rather than architectural detail and there are no flat plans. Probably half the book is illustrations, a mix of historical photos, printed ephemera and Rosie Louise's fascinating photo-based vector graphics. There several dozen of these in various sizes and I thought, because of their precision, they sat rather oddly with the historical black and whites that varied enormously in quality. This will probably be the only book on the subject and worth it for Ms Louise's vector graphics. Incidentally I bought this book from the publisher's website at a remarkably good price but elsewhere on the net the cost seemed excessive. I always thought a grid was like a bit of scaffolding, it provides a framework for the designer to tip in the type and images and keep a consistent visual feel through all the pages of a magazine, annual report, brochure, book, website et cetera. 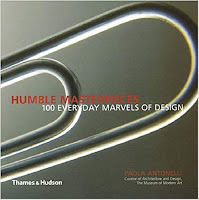 The author's book is more a collection of interestingly designed spreads by other designers which show very little connection to the publication's grid and it seems totally absent in many of the reproduced sample pages. If I was doing a book on using grids I would look around for three or four magazines (weekly and monthly) some brochures, website, a couple of highly visual books (like a cook book). All of them would be designed using a grid. Having selected various spreads from these for the book I would overlay the grid on each spread to reveal how the designers used the format to display the elements on the page. 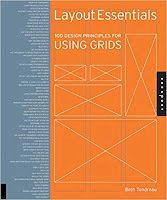 Each grid would stand alone on one page with the various dimensions and type specs for the different publications. The reader could look at the various spreads (and single pages, too) so that the overlayed grid explains itself. An interesting spread in the author's book oddly appears right at the back: Quick start guide. It's an essential check list of questions any designer would ask even before lifting a pencil, for example: Is there a lot of running text? ; Is it one color, two or four? ; Are there a lot of elements? Section headings, running heads, charts, tables, maps? ; Does the material warrant just one face with different weights or several typefaces and what sizes for text and headlines? All of these ingredients and more should be taken into account when creating a grid. 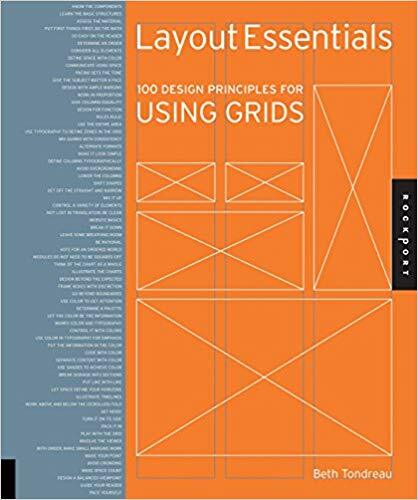 Using grids is just another Rockport light weight title that doesn't deliver what it should, they'll probably publish a similar book in three or four years time. How many of these are in your home? What I liked about the book is the range of subjects, for example the hundred include: a Filofax; Slinky; bubble wrap; Lego brick; ball bearing race; Hex wrench set; a pushpin; a zip; bar code and from centuries ago a champagne cork. Plenty of other books (and a favourite editorial for magazines, too) cover the origin of every day products but not as many as a hundred. Maybe the book's sub-deck 'marvels of design' could be stretching it a bit to include Adams chewing gum, a sugar cube or a spaghetti noodles but they need machinery to make them in the most efficient way. The odd one out in the hundred is Milton Glaser's I love NY logo (where love is a heart symbol) simplicity itself and the book shows it on a T-shirt. The text to each object is an interesting mix of historical data and manufacturing detail. I didn't know that the ZEROLL ice cream scoop (the one that's made out of one piece of aluminium) has some antifreeze in the handle part which takes heat from a users hand and transmits just enough of it to the bowl allowing the curl of ice cream to fall out. This seven inch square book could be considered a marvel of design. Each spread is the same, a large, extreme close-up of the product on the left-hand page and on the facing page a block of copy and a small cutout of the item, the typography is clean and tidy, too. Because the close-up photos are interesting enough they don't make looking through the book predictable.